Disable Blue Tick in Whatsapp :- There was this new update which shows a blue tick when the other end views your message, it seems quite good to know a notification which tell the message is been read but some time that might prove fatal. So in this post we will revel how toÂ Disable Blue Tick in Whatsapp. The latest update was introduced a week ago and with the introduction of that a lot of complaints are being registered which is not good at whatsapp part. So they decided to update the whatsapp and undo the mistake they have done with the addition of ‘Read Receipts’. With the increasing number of dislike rather than the upvote whatsapp introduced the solution called rear receipts which is responsible for the blue tick. Although this new update is not official but soon will be, with the introduction of this new update will lead to lesser complaints. Lets have a step by step look at it. How toÂ Disable Blue Tick in Whatsapp. Step 1 ) Before beginning make sure that the latest version or 2.11.44 or above is necessary to make this thing work. 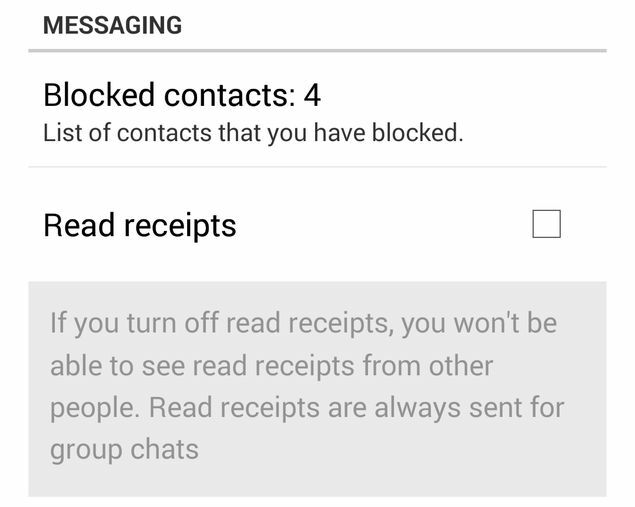 Step 3) No the update will add a new tab about the Read Receipts that will automaticallyÂ Disable Blue Tick in Whatsapp.